The LVL desk build continued with the legs. 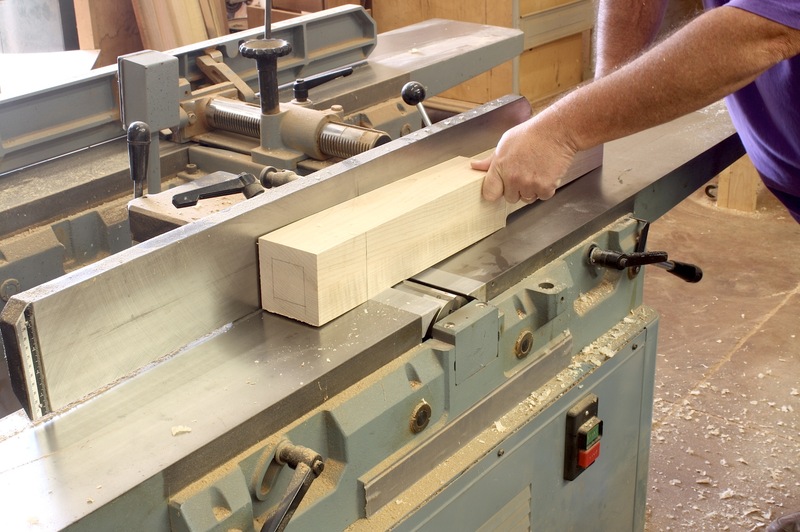 I milled 8/4 material, then joined two pieces to form four 3-1/2″-square legs. Square wouldn’t do, so we decided to taper the 28″ lengths over 24-1/2″, leaving a bit of square at the top. Tapering legs is best done at a jointer, if you ask me. As long as you hit your layout lines, you can nail each leg so that they are all tapered exactly. It took only minutes to taper all 16 sides. Still, the legs didn’t have the right look, so we decided to chamfer the corners. But how do you stop the chamfer at the perfect location? You don’t. We trimmed the corners along the legs entire length; that left the square portion at the top end tapering out of the cut made at the router table. To join the legs to the top, we went with a simple idea – dowels. If we would thought of this at the beginning, we could have drilled the leg ends while the blanks were still square. But, of course, we didn’t, so the set-up was a bit more involved. I rotated the table on my drill press, clamped a straightedge in position then centered the 1-1/4″-diameter bit in the leg, which was clamped to the straightedge. (Told you it was more involved.) Holes were drilled about 1-1/2″ deep because the arm of the press came down onto the rotated table to stop the cut. That wasn’t enough of a hole in my opinion. Afterward, each hole was set another 1-1/2″ in depth, and dowels were glued in. For each leg to fit tight and flush with the bottom surface of the tabletop, it was imperative that the 1-1/4″-diameter holes drilled through the top be square to the large flat surface. There’s no better tool than a router for this work. I don’t, however, have a router bit that diameter, so there was no way to plunge the holes as you would when knocking out adjustable shelf pins. The next idea worked perfectly. drill through the top in the correct location using a smaller diameter drill bit (in this case I used 3/4″), then enlarge the hole using a top-mount pattern bit. All that’s needed is a scrap piece of plywood with a hole drilled exactly to size; that’s easy with the drill bit already in the press. 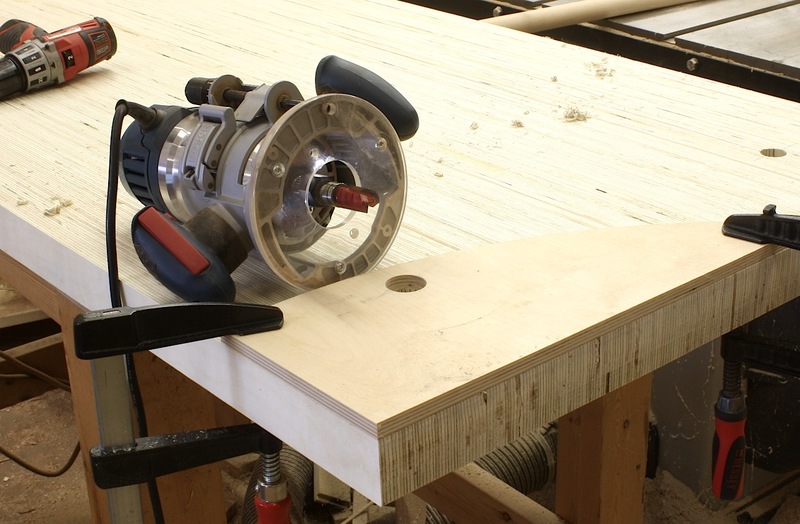 To use the jig, clamp the plywood piece in position on the table’s top over the previously drilled hole, slip the router setup into the hole with the bit’s bearing riding along the plywood cutout and rout a perfect matching-size hole in the top. To get through the entire 2″ of top, we had to remove the plywood and repeat the steps using the trimmed portion of the hole as a guide. Easy, peasy! With the holes drilled and the dowels sawn for wedges, we slipped the legs into the top, spilled a little glue into the sliced dowel then drove walnut wedges to bring everything tight. The final look with the dowels and wedges trimmed look good. Plus, there’s no wobble in the table, especially after the glue dried. Years ago at Woodwork Event shows, I taught seminars on router techniques. I shared tips on router joinery, jigs and fixtures associated with routers and talked about basic router uses. As I neared the end of the 90 minute seminars, provided there were few questions, I would jump into “fill the time” mode. I would ask if anyone had a drill bit that cut 4 1/8″ diameters. Of course, no one had such a bit, or if they did they would not admit it in front of others. 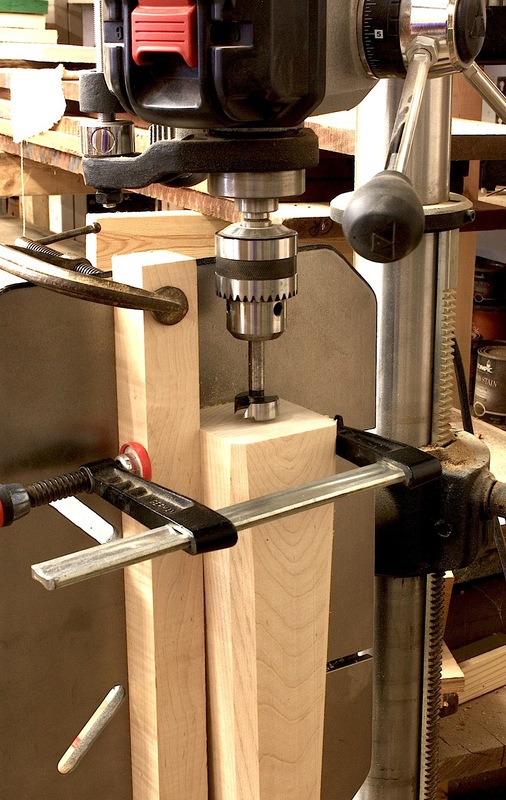 The reason for my question was to open my discussion of how you could use two router bits – a pattern bit and rabbet bit – to create a hole of any size. I seldom used this technique, but I sold it as a way to create holes large enough to act as supports for dust collection pipe. J-hangers, commonly used to hang plastic pipe, were easily broken. If, however, you had a hole at the center of a piece of plywood, you could hang pipe forever. It’s a simple technique. 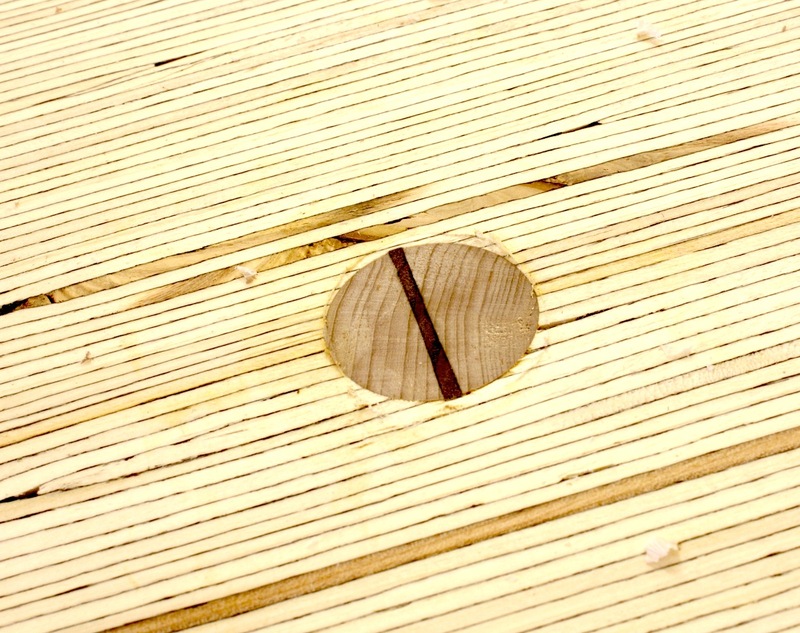 Begin with a 1 7/8″ hole drilled at the center of your plywood – a drill bit of that diameter is not out of the ordinary. 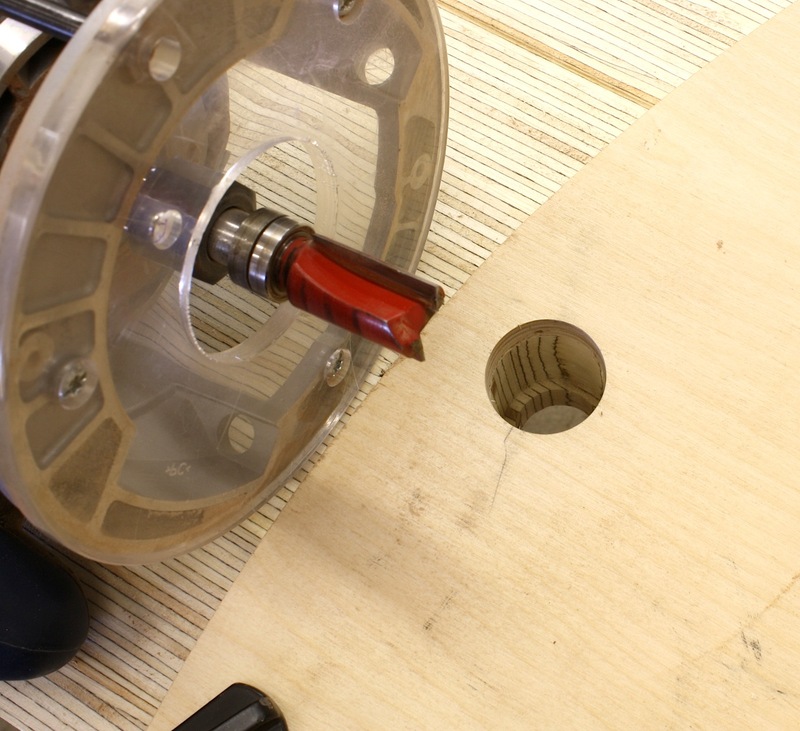 Step two is to cut a 3/8″ rabbet around the inside of the hole, then using a pattern bit where the bearing rides along the rabbeted shoulder, remove the remaining material to open the hole 3/4″. Your hole now has 2 5/8″ diameter. Repeat the process two more times and you then have a hole with a 4 1/8″ diameter. The technique works. It’s fun to talk about, and any diameter is possible depending on the size of your rabbet cut and the diameter of the hole in which you begin. Until this week, I thought hole resizing was about the only use for this technique. As I worked on my waist door for the Egerton tall clock, I found another use. My door, as can be seen on the original clock in the opening photo, has a shaped top. The door also has edge banding that surrounds the veneered panel. For that, I needed to cut a recess. My table saw worked great on the straight sides of the door, but for the top I needed a perfectly sized pattern that was offset from the door’s outer edge by 1″ exactly. I could have drawn a pattern, but would that have been an exact match? Instead, I grabbed a piece of plywood then used a pattern bit to get a profile directly off the door. I then went to my router table and stepped two times using a 3/8″” rabbet bit and my pattern bit, then grabbed a 1/4″ rabbet bit to compete my profile. My adjusted pattern was an exact match offset by 1″ (3/8″” x 2 + 1/4″). If you look at the photo above, you may think that the sized pattern matches the door profile and I could have simply slipped the profile down the door and went to work. You would be wrong. The photo below better shows the relationship of the sized pattern and the door profile. Using this technique was the perfect solution. This technique works. Now I’m left wondering where else I could use it, and if there are other seldom used router techniques that could make work in the shop better.